So Asda has dramatically changed tack. This US-owned supermarket, along with Amazon, led the way in introducing this American phenomenon to UK shoppers. Other retailers then jumped on the Black Friday bandwagon, offering huge discounts and promotions. So big was its effect last year, the event completely distorted Christmas spending, pulling forward sales, right at the most crucial time of the year when retailers should be selling their goods at full price. And who could forget the scenes of chaos in some stores. Three years on, Asda is effectively trying to put the genie back in the bottle. Instead of investing £26m in a Black Friday frenzy, it's now spreading that money in a series of savings and promotions across the Christmas season. 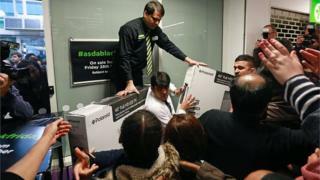 Asda cites customer fatigue, saying it reckons its customers want better savings across everyday Christmas items. But the move is not without commercial risk. There's a finite amount of Christmas money that shoppers have to spend and if they splurge out on big ticket items and deals with other retailers at the end of this month, then Asda could miss out on its share of that spend. The online retail industry body, the IMRG, has been reminding me that it surveyed dozens of retailers in the aftermath of last year's Christmas trading and found that although those offering discounts saw an average sales uplift of 180%, even those that didn't take part so sales increase by nearly a quarter. Asda will be hoping they see some of that uplift. So what effect will Asda's move have on the rest of the industry? Some retailers will be breathing a sigh of relief after the havoc this entirely manufactured event has brought - not just to margins but on the logistics side as well. But all the signs are that this year, Black Friday is still going to be big, possibly record breaking, with the IMRG predicting that online spending could break through the billion pound mark for the first time.